Morgan M was a French restaurant in Holloway; it has now closed. 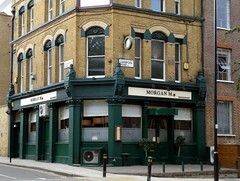 In November 2011 the chef, Morgan Meunier, opened another restaurant in Smithfield (Morgan M Barbican) and reduced the opening hours of the Holloway branch to dinner only, Wednesday to Friday, then later closed it permanently. As of September 2012, the site was occupied by another restaurant called Assiette Anglaise photo. This closed in its turn, and as of August 2014 it's a restaurant called Bosco photo. The information below is retained for people who want to know what it was like as Morgan M.
A French restaurant in Holloway which opened in 2003, and was refurbished in early 2007. There is a good selection of meat dishes on the a la carte menu, and unusually they also have a six-course vegetarian tasting menu ("From the Garden"), which they can make vegan on request. There is also a corresponding meaty tasting menu, and matched wines are available. The space inside is quite open with large tables, though the atmosphere is kept hushed and reverent. The waiters are attentive and happy to provide diners with tap water (which is kept filled at all times). Every course and its accompanying wine is announced (so quietly it was hard to make out at times), and napkins are obsessively refolded by staff when diners venture to the toilets. The food itself has an emphasis on light textures — sorbets, carpaccios, soups and purees dominate. On Ewan's October 2007 visit, the most substantial course on the vegetarian tasting menu was a stuffed pepper, but even this was filled with a light and creamy goats cheese. Nevertheless, the food is expertly done, impeccably presented and, importantly, very tasty. Juliet visited in April 2008. They are happy to veganise the veggie tasting menu, and although I did warn them in advance, they didn't seem remotely bothered by this and I think would probably manage fine without warning. The vegan version was nice, but IMO not quite as good as the veggie one (which Pete had). It was also a lot less filling, probably because it didn't have the cheese, butter, etc of the regular veggie menu. Pudding was fruit with very nice sorbet — good, but I always feel a little disappointed by fruit salad as a vegan pudding, even if it is very good fruit salad! NB: I don't want to be critical here — it was still very good food. Just not (in the vegan version) spectacular overall, although two of the five dishes were verging on that. The wines don't match quite as well, either — most notably for the first course, which for veggies was a cream of broad bean soup. The very light supplied wine was great with that, but didn't stand up at all well against the beetroot soup offered as vegan option. Still, they get vegan-friendly points for doing it as well as they did! Last visited by Juliet and Pete, April 2008. Opening hours taken from Caterersearch article, November 2011. Last edited 2014-08-21 08:01:06 (version 24; diff). List all versions. Page last edited 2014-08-21 08:01:06 (version 24).